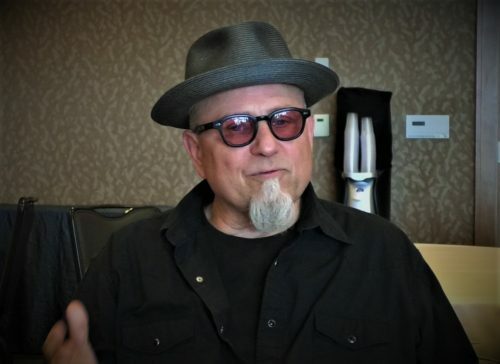 By Gina Yarbrough/San Diego County News SAN DIEGO–Bobcat Goldthwait, the iconic comedian and actor, known for his off-beat comedy on stage, film and television, was at San Diego Comic-Con Thursday to promote his new, truTV’s anthology series, Bobcat Goldthwait’s Misfits & Monsters. Goldthwait created and wrote the weekly anthology series which mashes up different genres to tell suspenseful stories with funny, imaginative twists. The series’ plots are reminiscent of Rod Serling’s anthology series, The Twilight Zone which ran on CBS from 1959 to 1964. However, Goldthwait’s eight episode tales are filled with part nostalgia and modern satire. The first season of Bobcat Goldthwait’s Misfits & Monsters features guest stars Michael Ian Black, Bridget Everett, Dave Foley, Seth Green, Melissa Joan Hart, David Koechner, Danny Pudi and other notable actors. San Diego County News joined Goldthwait at a press conference at the Hilton Bayfront Hotel in San Diego. In the video, Goldthwait talks about the creation and vision of his anthology series. Enjoy!